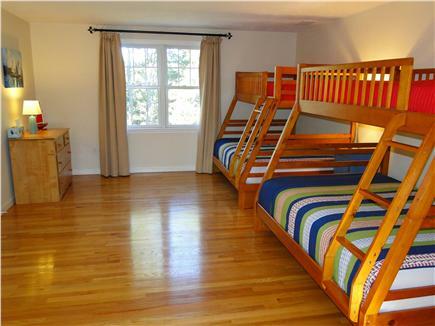 Upstairs bunk bed room, great for kids! This 3,000 sq ft. plus rental is equipped like a home with quality furniture, appliances, finishes and every amenity you could think of to make your vacation complete. 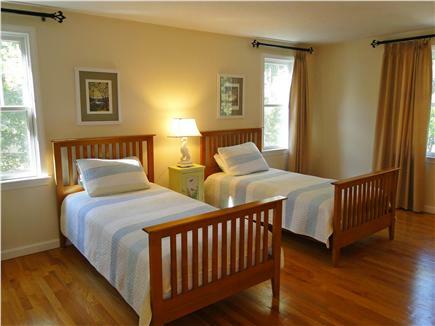 Our home boasts an open floor plan, with 4 bedrooms - one downstairs (queen bed), two upstairs (one with two twin beds and another with two bunk beds). 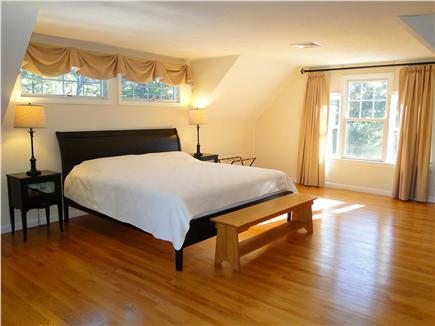 The master bedroom (king bed) is accessed through a separate stairway. 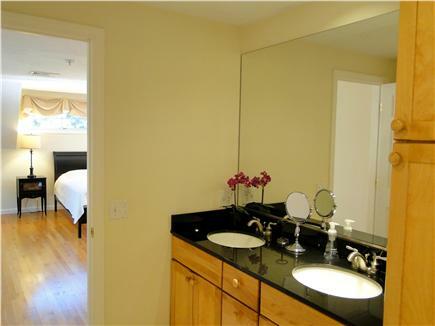 The master bedroom also has a private balcony and private full bath. 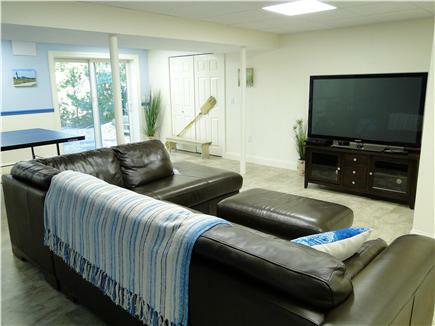 Game Room at basement level. 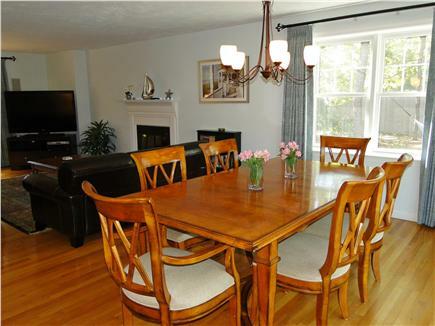 Features ping pong table, pool table, TV/couch area, and walk out to patio level. 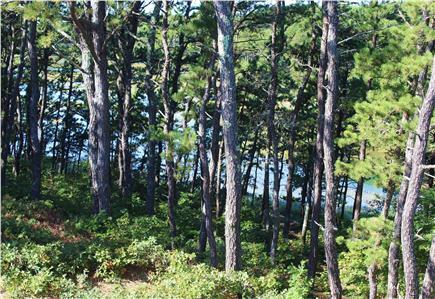 A Large deck overlooks the water at high tide and is surrounded by about 1.25 acres of protected land. 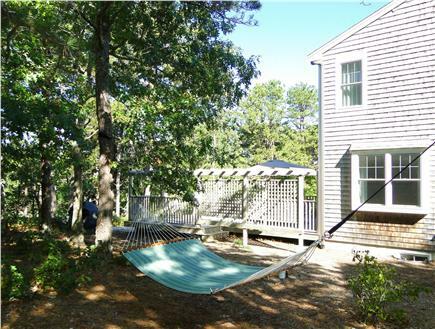 Enjoy the serenity of the sunset or kayak from the house to the Wellfleet Bay Wildlife Sanctuary or bike through the Cape Cod National Seashore. Beautiful Marconi Beach is just 2.5 miles away. Amenities include: A chef’s kitchen, new appliances, oils, spices & every tool necessary * spacious rooms with new mattresses * granite countertops in all bathrooms * central air * gas fireplace * Wifi * cable * DVD/PlayStation, games, books, beach toys * outdoor shower * gas grill * hairdryers * LG high capacity washer/dryer. Come unwind & enjoy your home away from home! Additional pricing info: Cleaning Fee $250.00; Linen Fee $100.00 (optional); Security Deposit $400.00 (refundable), State and local taxes of 12.45% will apply. Very comfortable and spacious. Calm and very nice environment, nice view from patio. Kitchen fully equipped! Perfect for Cape Cod family vacation! Thank you, Irena, for a wonderful family vacation in Wellfleet. 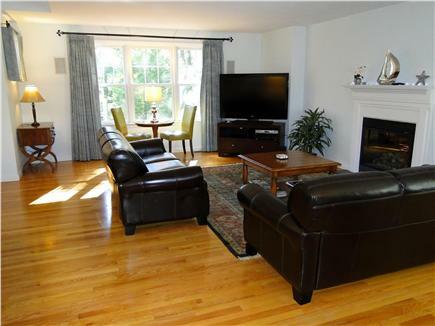 On one of the hottest weeks on the Cape, we enjoyed a super clean, comfortable and COOL stay in your beautiful and spacious home ideally located in our favorite town on the Cape. We were two families and a set of grandparents and the house was perfect for us. The bedrooms were large and accommodating and the basement family room with large TV, pool table and ping pong was AWESOME for our tweens. Just returned from a one week stay here. 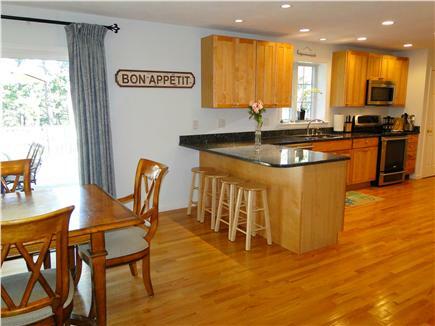 Rent this house- you will not be disappointed! Great for two families. 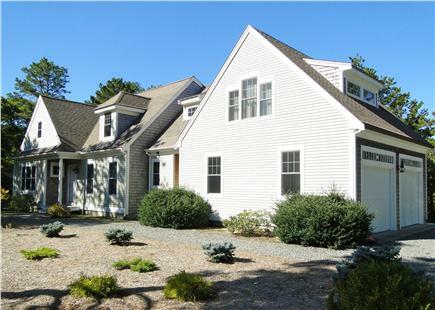 Open layout, immaculately clean with all the accessories needed for a great Cape vacation. Irena made it easy to book. She was very prompt in all of her correspondence with us leading up to our vacation and provided a very detailed book upon arrival for the house and surrounding activities. Much appreciated. We will be back! We rented this house with another family (4 adults and 6 children). The house was so clean and simple. The furniture is well taken care of. We loved and utilized the basement with the pool table and ping pong table a lot, especially on those rainy days. 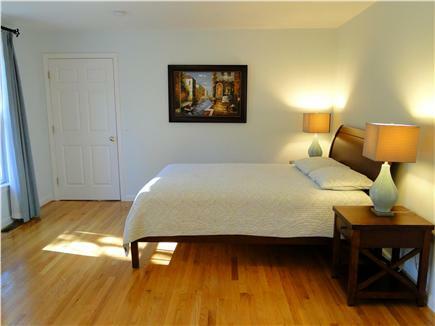 It's in a great location and close to Marconi Beach. We really enjoyed our stay. Thank you! We loved our stay. The home is in terrific shape. It worked well for our family of 3 grandparents, 3 adult child and two grandchildren. While we would have liked to be closer to town, it is well worth the compromise to rent this home if you are a large family like ours. This home is well stocked and has plenty of privacy for everyone. Great walking neighborhood, as well. The bike path can be picked up across Rt 6 not far from the neighborhood entrance. While we did not meet the owner, Irena, in person she was a delight to work with. Amazing House in an Amazing Town!! 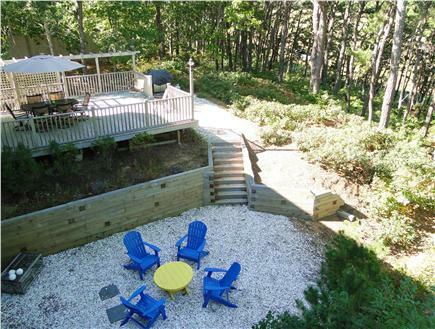 This house was amazing and my friends and I could not have had a better experience in Wellfleet or with Irena! She was so kind and responsive to every inquiry we had before arriving and while we were there. 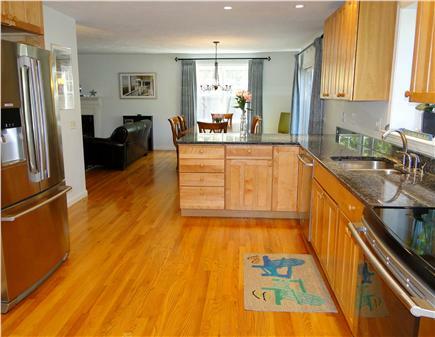 The house is a beautiful, spacious home that is only a short 5 minute drive to the beach. I highly recommend to anyone looking for a vacation to stay here!! My husband and I began visiting Cape Cod in 2000. We fell in love with the National Seashore area from Eastham to Provincetown and always said one day it would be nice to own a home in the area. In 2012 we decided on our home in the unique town of Wellfleet. With our 3 children we continue to enjoy fishing and kayaking in Gull Pond, surfing at Marconi Beach, bike riding on the various trails, and hiking at Great Island as well as the natural serenity offered on the back deck. Simply stated Blue Heron, as the dubbed name, was carefully created to be a home away from home. You will find every convenience here without the responsibility other than to sit back, relax and enjoy. 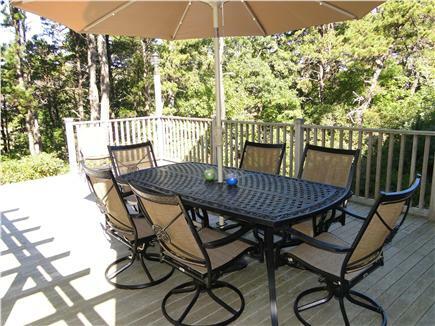 Blue Heron is nested between Mass Audobon's Wellfleet Bay Wildlife Sanctuary and Fresh Brook salt marsh, therefore when you are enjoying your morning coffee or barbeque dinner on the back deck the surrounding nature will ease your mind and soul. The sunsets are not to be missed especially during low tide as you can walk out towards the bay. If your day is rained out there is no need to worry. 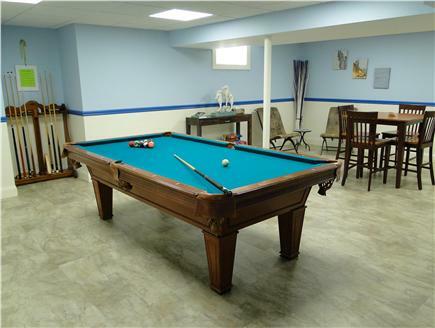 You'll find the newly completed Game Room in the basement a great source of entertainment in the form of ping-pong, pool/billiards, sectional TV with large screen TV and pub table convenient for game boards. 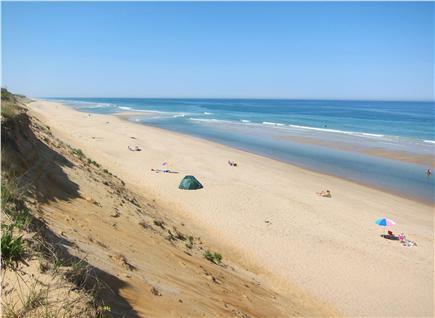 Wellfleet is special because 61% of the land is in the Cape Cod National Seashore Park. It is all that you would expect from a quaint rural seaside town. It offers wonderful shops, restaurants, and galleries. Take a short drive from our home to one of the pristine beaches and then finish your day in the warm waters of one of the kettle ponds. Wellfleet is nautical, charming and offers an abundance of shellfish. You can call ahead and pick up your lobster dinner just as it comes off the waters at the harbor.